Design for America is an organization started by college students at Northwestern to bring design thinking to its campus and local communities. It has now grown from one to about fourteen different chapters at different universities across the country. I am now a proud member of the chapter in its second year at Brown & RISD. I found DFA through a friend on a trip to IDEO’s Cambridge offices for a tour and presentation on design. We spoke of OpenIDEO, an online platform to bring people across the world to collaborate on real world issues stemming from increasing bone marrow donors to finding a useful way to eliminate electronic waste that finds its way into our landfills. Design for America is strikingly similar—we explore problems that face everyday people, we pick a worthy cause, find community partners and implement solutions. I was more than excited to get involved. 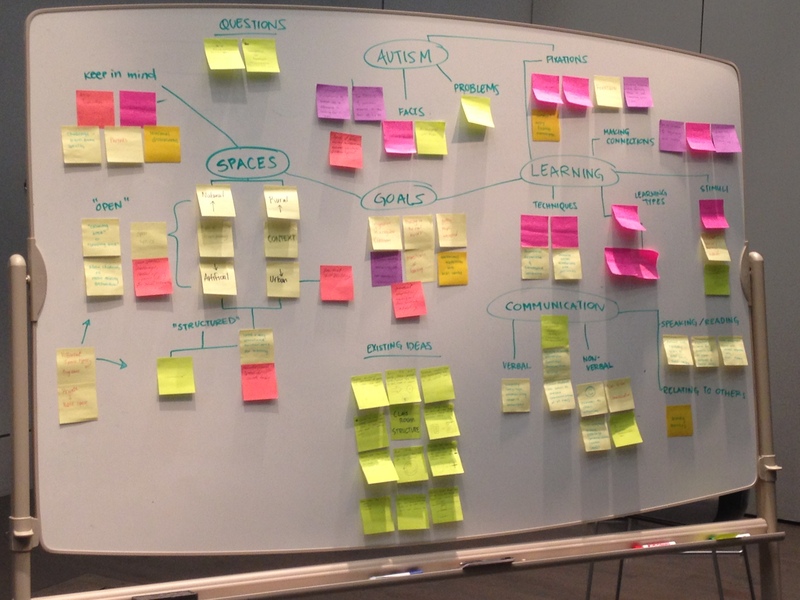 Anyway, our original question became—How do we develop a means of improving learning spaces for people on the autism spectrum? Now this could span from a single tool, to a classroom, to an entire campus. So we took that question and jumped right into the first stage of the DFA design process: scope. To begin our research phase, we took to the internet and libraries to find as many articles, sites, books and videos that could teach us more about autism. Then after we shared our information and taught one another what we learned, we laid out all that we found and tried to organize it the best we could. We also met with our mentor, Nancy Harrod, who is working on a living learning community for people on the spectrum. She wrote an awesome piece about DFA and our project here! We knew we couldn’t stop there, so we moved into the discover phase of the design process. We needed to find community partners and get hands on experience on our topic. 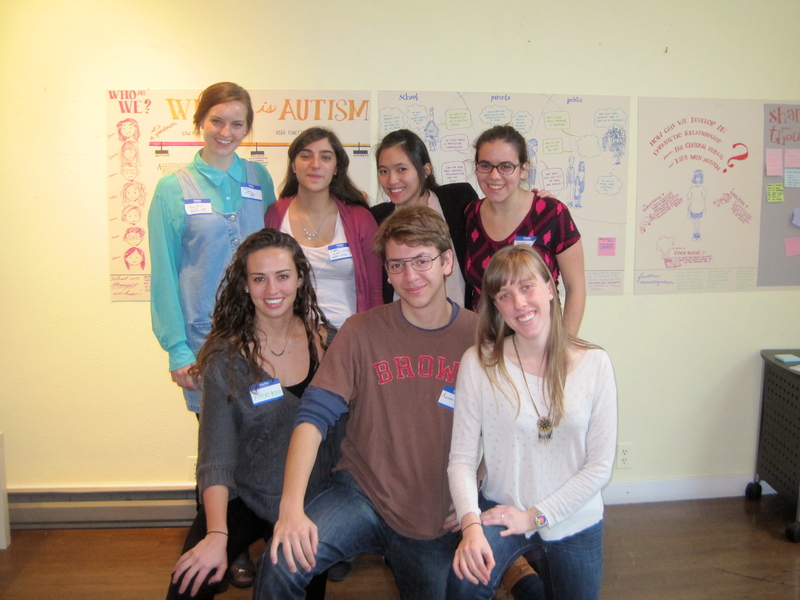 The Autism Project has continually been a great help. Susan Baylis allowed some of us to sit in and participate in their parent classes, where we not only learned about Autism, its spectrum and different means of communication and socialization– we heard real world stories from mothers (I’d consider them superwomen) whose children are on the spectrum. We also visited a classroom for children of special needs and spoke to the teacher about her space and how her lesson plans worked with the room. From both groups, we heard of the biggest difficulties they had with things like the transition period from school to the workforce, and communicating with those outside the child’s immediate support system about their disorder. Getting hands on experience with the support systems of those on the spectrum really allowed us to understand how the community worked with these families and allowed us to split up the community into three parts: the family, the school system, and the general public. We wanted to know what was out there for people on the spectrum, and we found a lot more than we expected to find– products that is. There were weighted blankets, balance balls, special cushions, sensory tools, instructional videos, iPad apps, etc. We asked the mothers what they thought were the best tools– they said a white board! They say its reusable, can be taken on the go, and you can make just about any picture or story on the fly to help their kids understand. So what can we help you with? Are learning spaces really the problem? Do you experience a gap in the aid somewhere? What tool isn’t out there? These are some of the questions we posed. When a mom suggest making yet another weighted object, we knew we weren’t getting to the heart of their needs. What if we could make the community understand autism better, what if we could spread empathy to the masses? The response we got from that very question was overwhelming. We knew we were ready for the reframe process. An exhibit or installation that would put the neurotypical in the shoes of someone on the spectrum while stimulating and satisfying the needs of a child with autism. The presentation you have seen throughout this post was a part of DFA’s Mid Semester Showcase. We have taken a break for the holiday but are looking forward to jumping right back into the ideation process. Please feel free to leave your ideas!